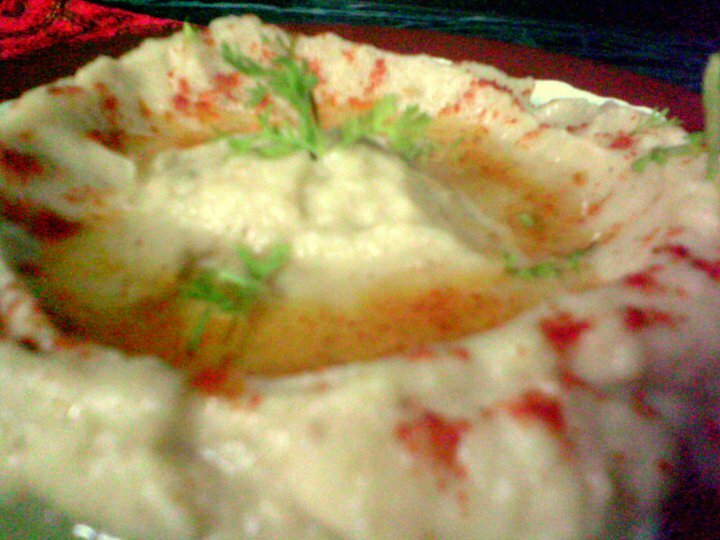 Homemade Hummus - The Healthier Version. Recipe from here, and the Tahini recipe is from here if you want to try it out. But I just combined the two. You can also just use store bought Tahini instead. But I'd suggest you try the fresh version. You can also substitute Tahini with 2 tablespoons of Peanut Butter. Makes a huge jar full of Hummus. 4 cups canned Chickpeas, But I suggest using fresh so 1 cup of raw uncooked Chickpeas. A sprinkle of Paprika or Cayenne Pepper Powder. Soak the Chickpeas in water overnight with 1/2 tablespoon Baking Soda. In the morning, change the water and let them soak for 5 more hours. Changing the water frequently actually makes you less gassy as per the recipe. Then cook them for 90 minutes on medium low with the rest of the Baking Powder and water, till they become soft enough that they mash up when you press them between your fingers. If you're using canned Chickpeas, you just need to get to the boiling part directly. I actually pressure cooked my Chickpeas for 10 minutes on high and they were pretty much done. By this time, the skins of the Chickpeas were floating on top of the water and some of them were resting above the Chickpeas in the water. You need to remove them, if you can. No pressure here. But do make sure that you thoroughly wash them, even if they are mushy, coz you do not want to feel gassy later. Before you wash them, save 1 cup of the boiling water for back up. You need to get rid of all the froth and scum from the Chickpeas. While my Chickpeas were in the pressure cooker, I just quickly dry roasted the Sesame seeds. Now you need to miss this paragraph if you already have Tahini at home, or are using Peanut Butter instead. But Tahini is basically just dry roasted Sesame Seeds blended with Olive Oil till they become a soft pourable paste. So I let the dry roasted Sesame Seeds cool a bit. Next, in a blender I blended together the Sesame seeds (not to be used if you are using Tahini/Peanut Butter, in which case you just add the 2 tablespoons of Tahini/Peanut Butter instead of the Sesame Seeds), Garlic, Cumin, Lemon, Salt, Sugar (Optional) and threw in some Chickpeas too, and added some oil. Blended them really fine into a paste, and repeated it for all the Chickpeas and consumed the whole 1/2 cup of Olive Oil stage by stage. If you have a big enough blender though, just throw everything together and blitz. You need to have a consistency little bit thinner than what you desire, and if it gets too thick, feel free to add the cooking water from Chickpeas at this stage. Voila! You're done. This Hummus is amazingly light and delicious, decorate it with a good drizzle of Olive Oil and sprinkle Cayenne Pepper on top. Sprinkle chopped Parsley too, but I did not have it at the moment so I just decorated it with a tiny sprig of Cilantro/Coriander. It stores quite well! Use it as a dip with your Pita Bread, or in a Chicken Salad, or as a dip with vegetables which is my favorite way to consume them these days. Dipped in Hummus! I really recommend this recipe! I have made hummus many times but had never thought of making the tahini before I have always bought it. But I am going to next time for sure. Thanks for the idea. Store bought tahini is the same story as char aney ki murgi, panch rupaiye ka masala. So thanks for the cheap fix. Making this right now!